Provide better support for beneficiaries receiving our various programmes and services. Bring Cherries of Smiles on their faces each day. Show appreciation that there are people out there like YOU who cares for them. Specific Project: To assist in the development of Bizlink’s employment creation projects for the needy disadvantaged. Example: Project Cookies, Project Books and fund raising activities. Public Education: To promote Disability awareness to the public for inclusion in the workforce. Plan and undertake/support public awareness projects. Example: outreach program, public education events and publicity campaigns organized by Bizlink. Editoral Support: To assist in the editorial team for the development of newsletter. Bizlink’s Ambassador: To conduct tours at Bizlink to advance Bizlink’s employment cause for the needy disadvantaged. Refer a Beneficiary: To refer persons with disabilities seeking employment assistance. Refer a Job: To provide employment opportunities for our needy disadvantaged clients. 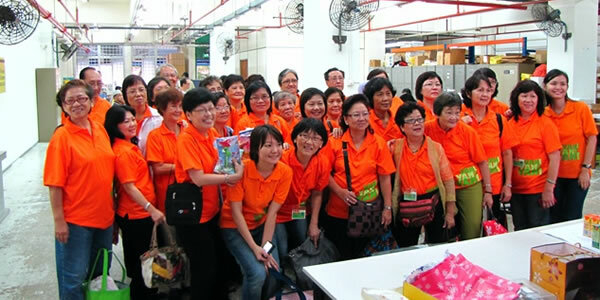 Buy a gift: To visit our gifts and cards website (www.gift.org.sg) for your corporate functions. Organise a CSR visit: To provide your employees the experience of a diversity and inclusion environment such as working alongside with person with disability. Organise a visit: To provide students the education and awareness of a diversity and inclusion environment within the mainstream society in Singapore. Volunteers are an integral part of the Bizlink Community. By contributing time, skills, support, network and with their passion to serve, volunteers have helped Bizlink enable employment and rebuild the lives of many disadvantaged individuals. Volunteers play key roles in our various committees, organize and implement a number of events. Many of our volunteers have gain new skills and knowledge, enjoy a sense of fulfilment, and developed personally. Bizlink welcomes you as our volunteer. Bizlink Friends is a network of individuals and corporations who actively support Bizlink’s cause. We have regular get-together thru the year over makan sessions, such as on Chinese New Year, Hari Raya, Durian Fest, Octoberfest, and Christmas. We also have other social events such as football tournament, trips to places of interests, various special interest groups, networking workshop etc. Bizlink Friends volunteer with Bizlink in various ways based on their interests and skills, doing something meaningful, while having fun and making new friends. We welcome you to join us! Click here to sign-up.